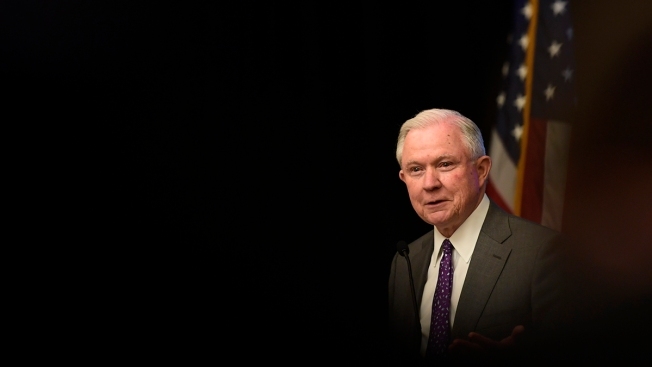 In this file photo, Attorney General Jeff Sessions speaks at the National Sheriffs' Association D.C. Opioid Roundtable in Washington, May 3, 2018. A group of more than 600 United Methodist clergy and members are bringing church law charges against Attorney General Jeff Sessions, a fellow Methodist, urging "some degree of accountability" over the Trump administration's "zero tolerance" immigration crackdown that has separated thousands of children from their parents along the U.S.-Mexico border, NBC News reported. The group accuses Sessions of violating Paragraph 270.3 of the denomination's Book of Discipline. He is charged under church law with child abuse, immorality, racial discrimination and "dissemination of doctrines contrary to the standards of doctrine of the United Methodist Church." The signees of the letter also criticized Sessions for invoking Romans 13, a Bible verse, to justify the Trump administration's policy. Two churches to which Sessions purportedly belongs did not immediately respond to phone calls from NBC News.